Do you remember the hall of distorting mirrors that used to come to the Hoppings every year? That, I discover, is very much the experience provided by an appearance on TV. I realised that I had put on a little weight since my engagement five years ago. In my more honest moments, I might even admit to being rather fat. 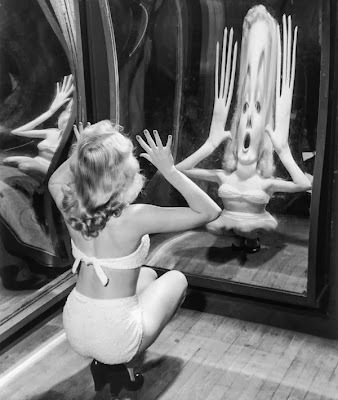 But it took a documentary film crew to make the staggeringly unflattering revelation that I am not only possessed of a vast corporation, but that it actually moves about independently as I walk. This is, for me, the most depressing aspect of Iceland Foods: Life Inside The Freezer Cabinet, which begins its run on BBC2 at 9pm next Monday, October 21st. My own bit part in this series as Iceland’s PR adviser was somewhat inflated by the fact that filming coincided with the Horsegate food “crisis”. The robust language I used at the time is apparently mainly responsible for the programme’s post-watershed slot. The “reality documentary” is, it seems, a great growth area for broadcasters, perhaps because the “talent” performs for free. They have already shown us everything we could possibly want to know about airports, airlines, railways, call centres and Greggs the bakers. Next comes Iceland, and soon every retailer will want one. I think there is a lot to be said for shedding light on the workings of businesses, but I’d be glad if the film-makers spread their net to other areas, too. In particular, I would simply love to see a fly-on-the-wall documentary following the process of building a wind farm. This already has all the ingredients that made the Alien film franchise such a box office success. The structures are repellent and it seems all but impossible to kill them off. In August my stomach and I were photographed among a happy band of local residents outside County Hall, after Northumberland’s planning committee unanimously rejected an application for a large industrial turbine at Follions in Whittingham Vale, on the edge of the National Park. The committee had heard eloquent speeches by our own councillor Steven Bridgett and by Tim Stienlet, whose nearby holiday cottage business faces ruin if the beauty and tranquillity that draws in his customers is shattered by this grotesque development. 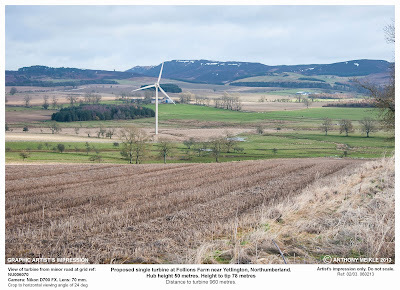 Those members of the Committee who spoke against the proposal made it clear that they did so from intimate personal knowledge of the area, and the damage that a huge turbine in this location would do to a unique and precious landscape. Yet now the developer has slapped in an appeal, with a demand for costs, on the grounds of the council’s “unreasonable behaviour” in turning down the application without a site visit. Allowing members of the public to clap and cheer opponents of the scheme apparently also threatened the impartiality of the committee, which seems to have overlooked the fact that there is a “presumption in favour” of “sustainable” developments of this sort. Well, God forbid that democracy should prevail and that the feelings of those who actually know and love an area should have the slightest bearing on planning decisions of any kind. 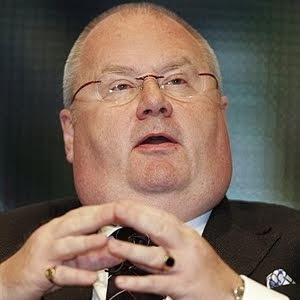 But if Eric Pickles’ recent pronouncements about giving due weight to the views of local communities have any meaning at all, the Follions application should be booted swiftly back into the bin to which the council rightly consigned it just two months ago. In the meantime the costly appeal grinds on, and I would urge anyone who cares for Northumberland, and has the slightest interest in keeping its tourist industry alive, to visit the website http://www.fightfollionswindfarm.co.uk/ and view the page on the planning appeal process. The deadline for representations is October 23rd, which means that you will be cutting it a bit fine if you leave it until 9pm on the 21st to start composing your letter. But you will find something else to fill the time, won’t you?